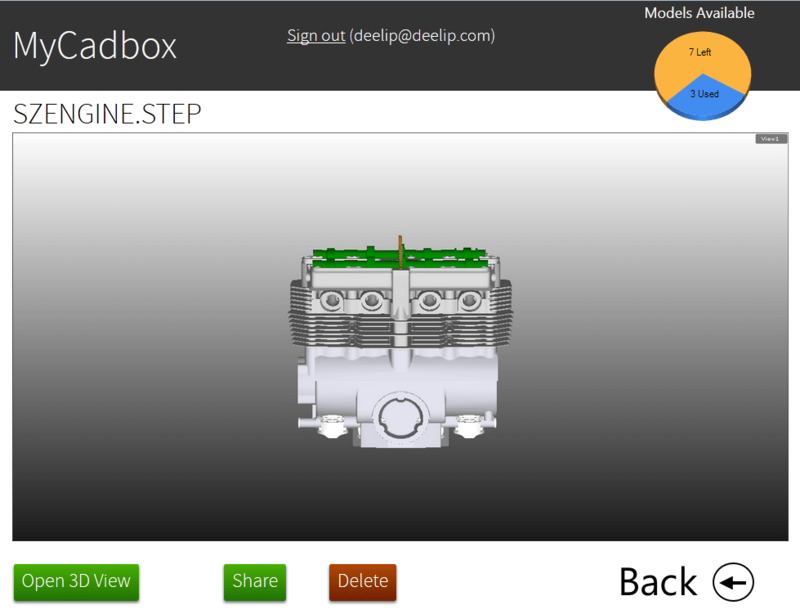 CadFaster has a new product in beta called MyCadbox, which the company claims to be a “DropBox for CAD files”. Even the logo has been “inspired” from Dropbox. 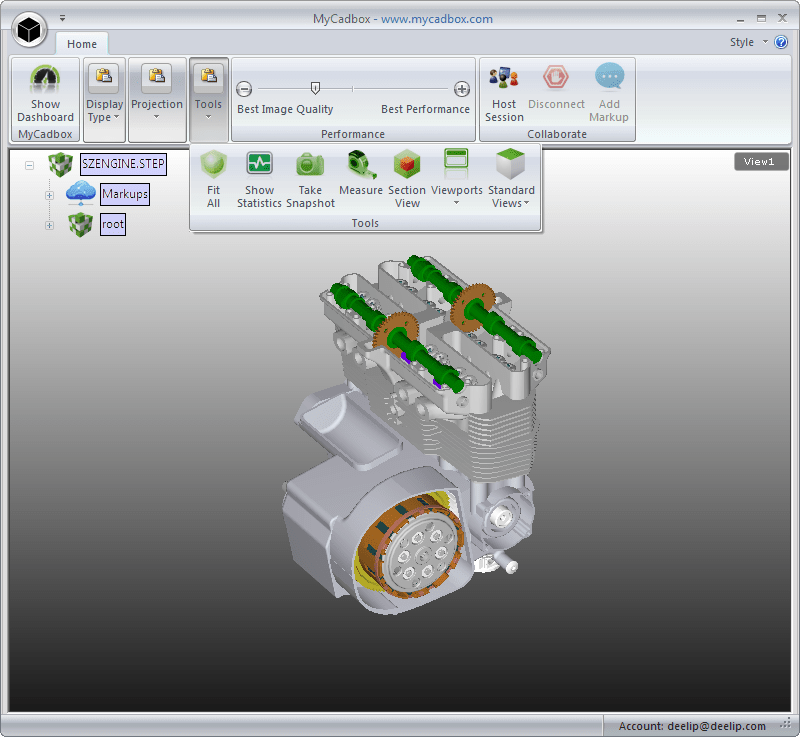 MyCadbox is a cloud based online CAD collaboration service hosted on the Microsoft Windows Azure cloud infrastructure. You basically upload your CAD files to the cloud where you can share with others and collaborate by adding markups and stuff. The actual marking up happens in an app on your computer (Windows only, no Mac), although they do have an iPad app as well. You need to download and install the free MyCadbox 3D viewer and markup app which appears to be based on their CadFaster|QuickStep product. The files in the browser show up as images (no 3D WebGL goodness). When you click the “Open 3D View” button it starts the MyCadbox desktop application where you can navigate around in 3D and markup all you want. Like DropBox, the free level of MyCadbox gets you 10 models, whereas the paid level at $10 a month increases the cloud sharing capacity to 100 models. IMO, that’s pretty low and may be put people off. A better option may have been to have a space limit, instead of a file limit. Being a beta, the MyCadbox site has its quirks. For example, after you sign up and then log in you are left staring at the log in page. That’s if you are running Firefox. If you are using Chrome it takes you to the MyCadbox dashboard. The comparison with Dropbox is fine. But there is something that needs to be understood. When you share a Dropbox folder with someone they actually download a copy of the same file that exists on your computer and in Dropbox’s cloud storage. In the case of MyCadbox when you add a model to your account you essentially upload a low resolution tessellated version of the CAD date to the cloud. When you share that model with someone else they download the low resolution model using the MyCadbox app on the PC or iPad. The other person can’t save the file out to disk. It would be pointless to save a low resolution tessellated model anyways. Unlike Dropbox MyCadbox is meant for online collaboration and not data sharing. You can sign up for a free level of MyCadbox here.